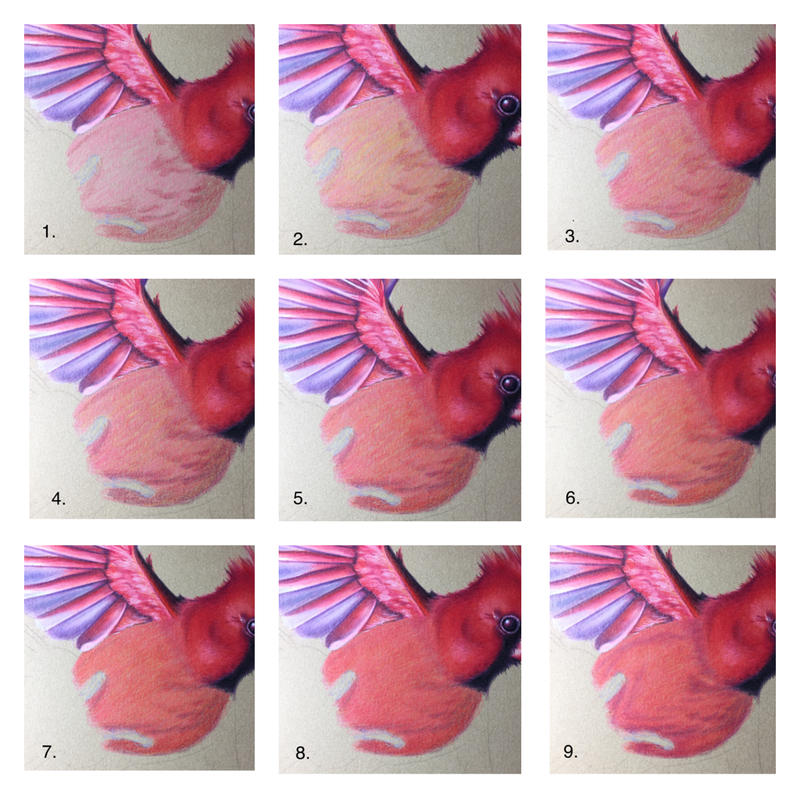 As it took me a while to understand how to draw fish scales, l thought some might find it helpful if l added this step by steo guide to drawing them. 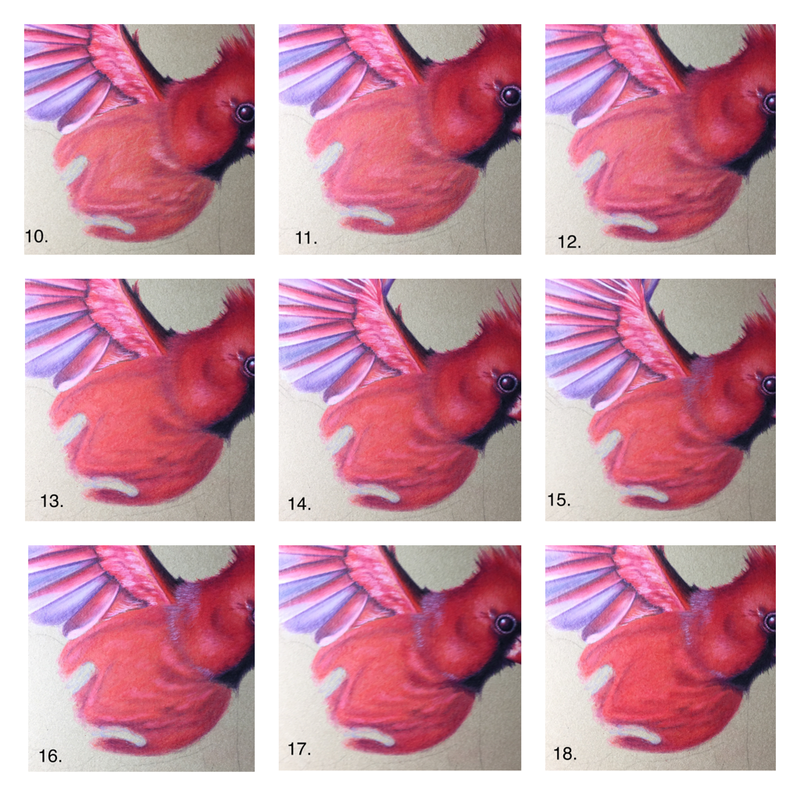 This is a guide to drawing the more even rype of scales. Not all scales are the same shape. Many are very, very irregular. The scales you see complete in these shots are totally irregular in shape and size, and there is really no option other than to draw these pretty much individually if you want to draw a realistic looking fish. The scales on the main body of the fish are more even in shape and so this method is the way l have worked out of drawing them. lt works for me. l am sure there are many ways to do this, l just share my way here. ln the final photo above l have added a lot of colors, carefully looking at my reference photo to see where to add them. l have added depth and vibrance with Polychromos in ultranarine, phthalo blue, indanthrene blue, mid phthalo blue, turquoise, helio turquoise, dark indigo and black and Luminance light cobalt blue and Pablos gentian blue. 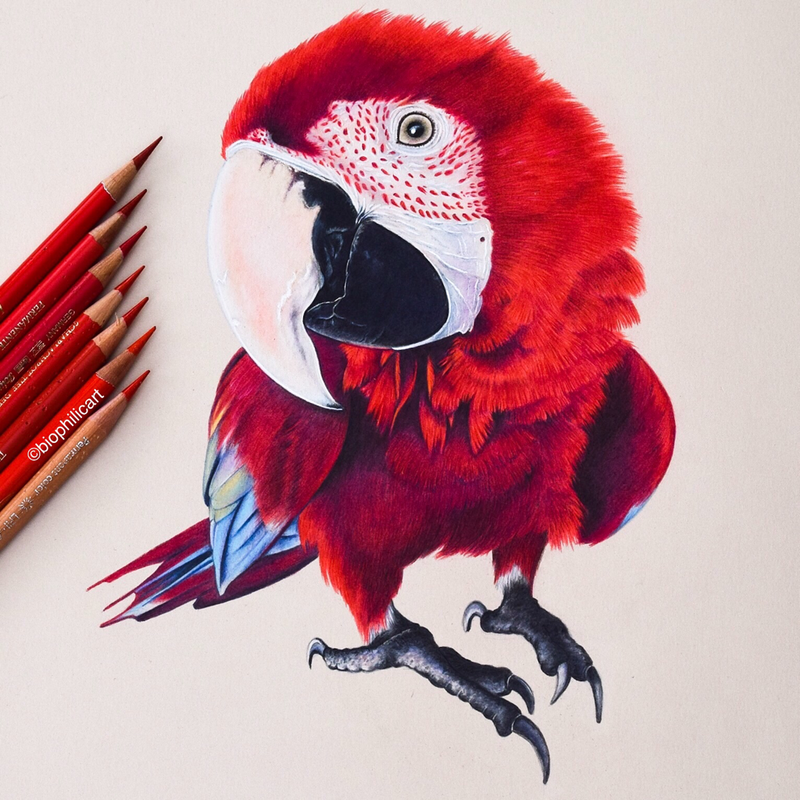 l have added definition to the outlines with Polychromos in madder, red violet and dark indigo. Finally l pick out contrast with Polychromos black, just hints and Luminance white. I will add a few more layers before completely finishing the piece, but that is basically it. ln the first picture you see here l am working out where each scale is to go (ignore any curved lines you see here, they are from my rough outline. Concentrate on the continuous lines). l look carefully at my fish and rather than look at individual scales try and see rows. l look at the horizontal rows first. These rows tend to follow the shape if the fish body and the rows are usually wider towards the head and narrow as they reach the tail fin. Count approximately how many rows there are. No need to obsess, but it does need to be roughly accurate to get the right sized scales. 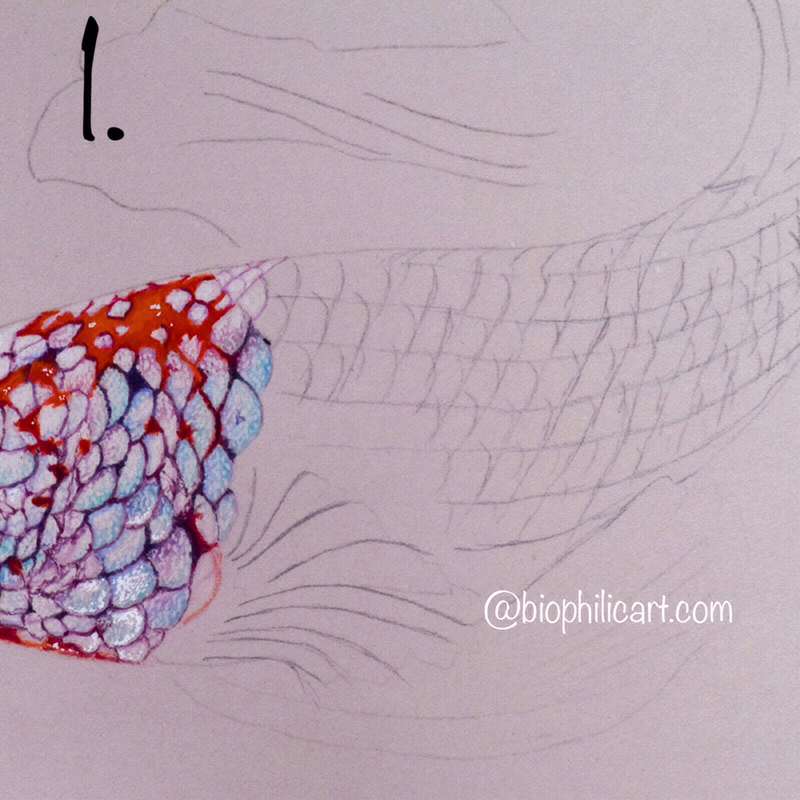 Draw in these horizontal lines using a light hand in a colour that will eventually be used to outline the edges of your scales. Next follow the same procedure for the vertical rows. These usually run diagonally down the body, but may go bear straight at times. You should end up with a rough diamond pattern covering the body as above. ln picture 2 l begin to draw the scale shapes. Each diamond is half a scale. Draw a curved diagonal line from one corner to the opposing corner. You can see this better from the mid section in my picture, l wasn't very accurate at the start of the row! l usually work along the whole length of one row to begin with. ln picture 3 above l work the second row in exactly the same way. As you draw the first half of the scales on the second row you complete the curve of the scales from the first row. It is easy to see where the curve should go at this point because the new row of scales guides you. ln picture 4 above l have completed the process over the entire body of the fish and you can see this gives a fairly accurate representation of scales. ln picture 5 above l begin to color the scales. 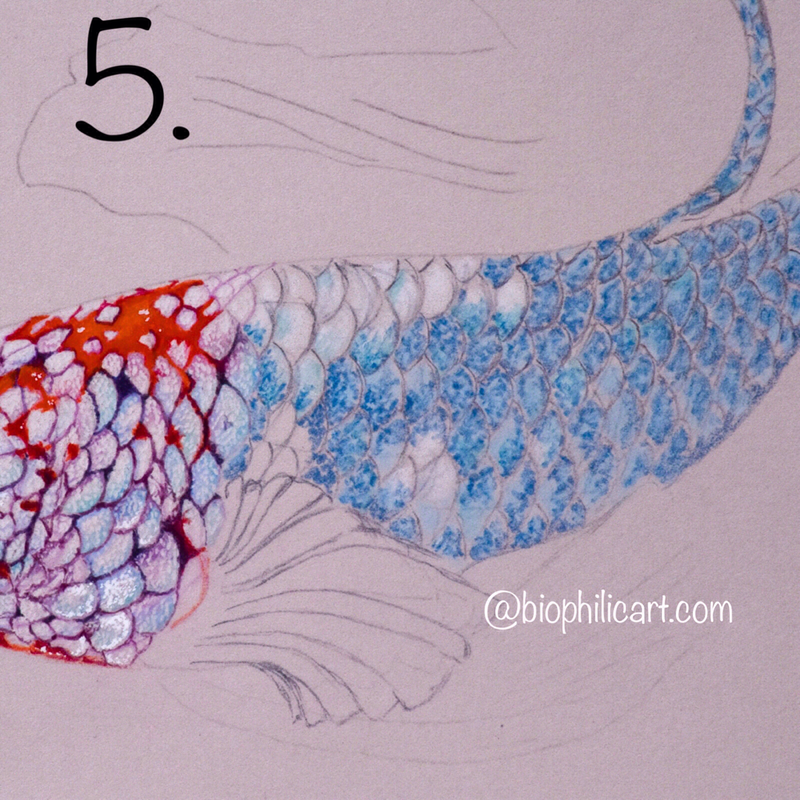 l use Luminance white and Pablos bluish pale as base colors for the scales and add just a little of the shading working in dots and small circles to create texture, with Luminance grey blue and Pablos turquoise green. l work the outlines in Polychromos dark indigo. ln picture six l work Polychromos turquoise over the whole blue area very lightly and use Prismacolors light aqua to work little circles of color where l see it on my reference photo. 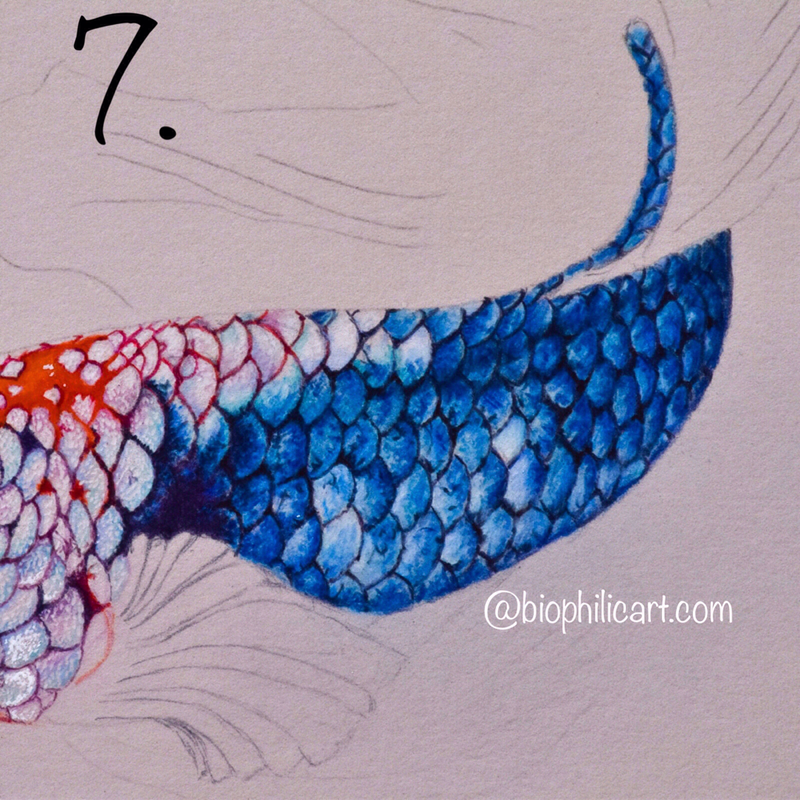 l then use Polychromos deep scarlet red to outline some of the scales and Pablos indigo blue to add more depth to the outlines all over. ln picture 7 l have added a lot of color now building depth and vibrance. Still working in little dots and circle shapes for texture. l have used Polychromos in ultramarine, phthalo blue, indanthrene blue, mid phthalo blue, turquoise, helio turquoise, black and dark indigo and Luminance light cobalt blue and Pablos gentian blue. 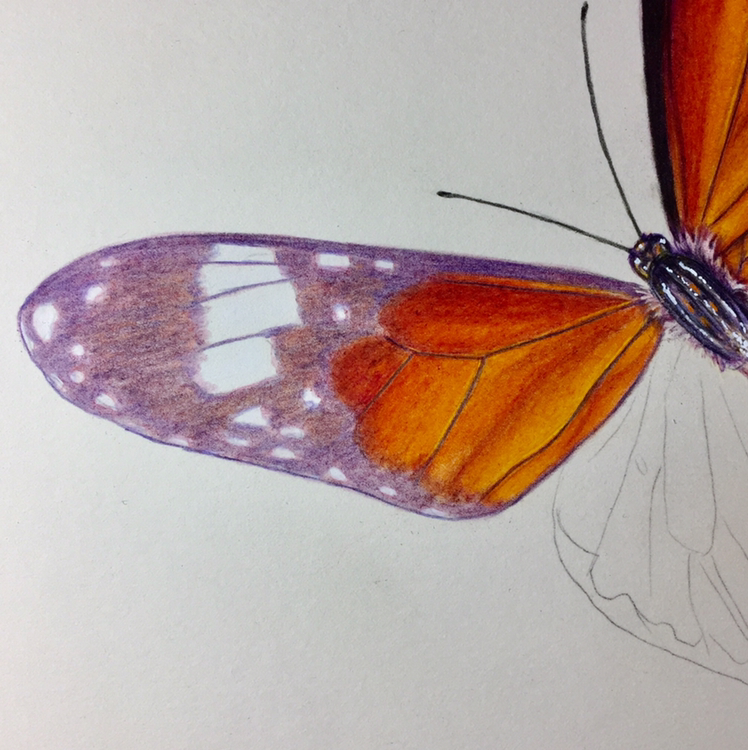 l have added depth and definition to the outlines with Polychromos in madder, red violet and dark indigo. Finally l pick out contrast with just a little black and highlights with Luminance white.